For introductory courses in managerial finance. This package includes MyLab Finance. The Teaching and Learning System -- a hallmark feature of Principles of Managerial Finance, Brief -- weaves pedagogy into concepts and practice, giving students a roadmap to follow through the text and supplementary tools. The 8th Edition, Global Edition, concentrates on the material students need to know in order to make effective financial decisions in an increasingly competitive business environment. It allows students to make the connections between a firm’s action and its value, as determined in the financial market. With a generous amount of examples, this text is an easily accessible resource for in- and out-of-class learning. MyLab™ is the teaching and learning platform that empowers you to reach every student. By combining trusted author content with digital tools and a flexible platform, MyLab personalizes the learning experience and improves results for each student. Learn more about MyLab Finance. MyLab Finance should only be purchased when required by an instructor. Please be sure you have the correct ISBN and Course ID. Instructors, contact your Pearson representative for more information. This title is a Pearson Global Edition. The Editorial team at Pearson has worked closely with educators around the world to include content which is especially relevant to students outside the United States. 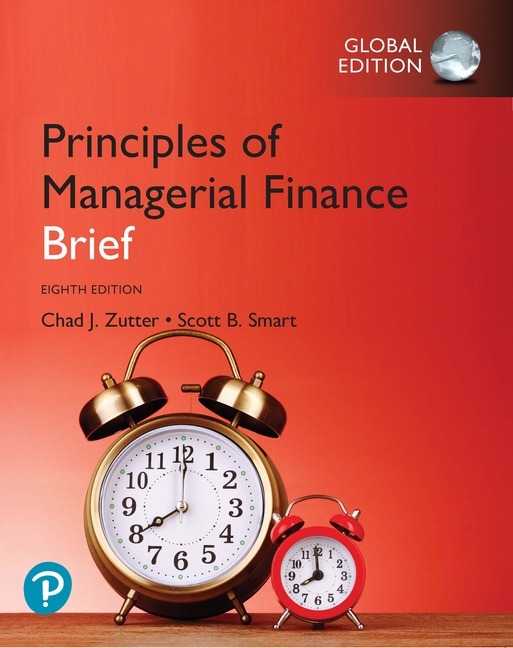 New - Chapter 1 provides expanded content focusing on the goal of the firm and the broad principles that financial managers use in their pursuit of that goal. New - Chapter 2 describes the financial market context in which firms operate, with new coverage focusing on the transactions costs that investors face when trading in secondary markets. New - Chapter 3 provides an in-depth ratio analysis using real data from Whole Foods prior to its acquisition by Amazon. The ratios help to spark conversations about some of the possible motives for the acquisition. New - Chapter 6 includes a discussion of the negative interest rates prevailing on government bonds in Japan and some European countries, as well as an expanded discussion of the tendency of the yield curve to invert prior to a recession. Updated - Financial calculator images that are featured in the book, match the financial calculator available on MyLab Finance. New - Chapter Introduction Videos and animations features authors who explain the importance of the chapter content within the context of managerial finance. The animations for select in-chapter figures and examples allow students to manipulate inputs to determine outputs in order to illustrate concepts and reinforce learning. New and Updated - Chapter 2 provides a new Focus on Practice box discussing how Qualcomm’s highly skilled labor force turns what often is thought of as a variable cost into a fixed cost and thereby creates operating leverage. New - Expanded coverage of the role that expected bankruptcy costs play in capital structure decisions. New - Chapter 13 highlights how and why companies have shifted their payout policies away from dividends and toward share repurchases over time. Updated - Focus on Ethics boxes highlight situations in which businesses or individuals have engaged in unethical behavior. The boxes explore the consequences of ethical lapses and the ways in which markets and governments play a role in enforcing ethical standards. Check out the preface for a complete list of features and what's new in this edition. This package includes MyLab™ Finance, the teaching and learning platform that empowers you to reach every student. By combining trusted author content with digital tools and a flexible platform, MyLab personalizes the learning experience and improves results for each student. Learn more about MyLab Finance. Deliver trusted content: You deserve teaching materials that meet your own high standards for your course. That’s why we partner with highly respected authors to develop interactive content and course-specific resources that you can trust -- and that keep your students engaged. Empower each learner: Each student learns at a different pace. Personalized learning pinpoints the precise areas where each student needs practice, giving all students the support they need -- when and where they need it -- to be successful. The Study Plan gives students personalized recommendations, practice opportunities, and learning aids to help them stay on track. Students can access a fully functional Financial Calculator inside MyLab and a financial calculator app that they can download to their iPhone®, iPad®, or Android device -- so they can perform financial calculations and complete assignments, all in the same place. Teach your course your way: Your course is unique. So whether you’d like to build your own assignments, teach multiple sections, or set prerequisites, MyLab gives you the flexibility to easily create your course to fit your needs. The Gradebook offers an easy way for you and your students to see their performance in your course. With LMS Integration, you can link your MyLab course from Blackboard Learn™, Brightspace® by D2L®, Canvas™, or Moodle®. Improve student results: When you teach with MyLab, student performance often improves. That’s why instructors have chosen MyLab for over 15 years, touching the lives of over 50 million students.